Abstract: Baker’s list of ‘ideal’ weed traits has been highly cited in both the invasive and weed ecology literature, yet none of these studies have considered the traits within one species. Here we performed a microevolutionary study to asses their evolutionary potential. 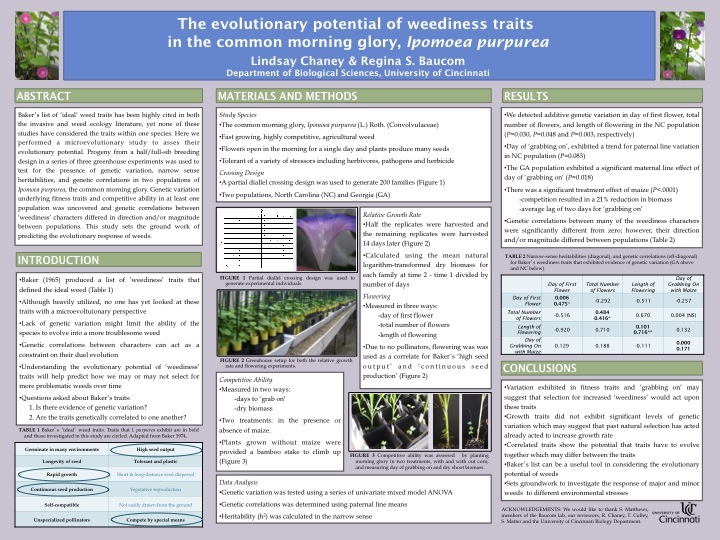 Progeny from a half/full-sib breeding design in a series of three greenhouse experiments was used to test for the presence of genetic variation, narrow sense heritabilities, and genetic correlations in two populations of Ipomoea purpurea, the common morning glory. Genetic variation underlying fitness traits and competitive ability in at least one population was uncovered and genetic correlations between ‘weediness’ characters differed in direction and/or magnitude between populations. This study sets the ground work of predicting the evolutionary response of weeds.